Israel's political process is too often framed in terms of a dichotomy between Jewish and Arab/Palestinian citizens of the state, a framing which perpetuates political inequality and consequent injustices. This book focuses on the conflict within Israel and the role played by modern states in either mitigating majority-minority conflict or exacerbating it. This comparative study concentrates on theoretical models and historical, legal or political patterns of development. With an emphasis on alternative approaches to alleviating civic and political inequality in a divided society such as Israel's, the book examines plurality and political pluralism as keys to enhancing Israel's democratic character. 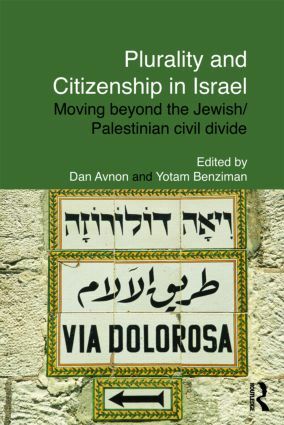 The dozen original essays address many of the basic points of contention between Jews and Arab/Palestinians within the Israeli civic body: unequal access to citizenship; unequal access to land; discrimination in access to public services; insufficient defence of minority rights in Israel's legal system; unequal obligations; unequal economic opportunities. The essays raise a matter of principle that goes beyond the Israeli case: formal legal measures are relatively worthless if they are not preceded by political processes that are oriented to changing conceptions and perceptions of reality. Relevant to those who wish to understand the unobserved dynamics within a divided society, this book will be of particular interest to students of comparative politics, conflict resolution and Middle East studies.